encouraging.com: Frazzled . . . to Freedom! How Do We Get There? Frazzled . . . to Freedom! How Do We Get There? 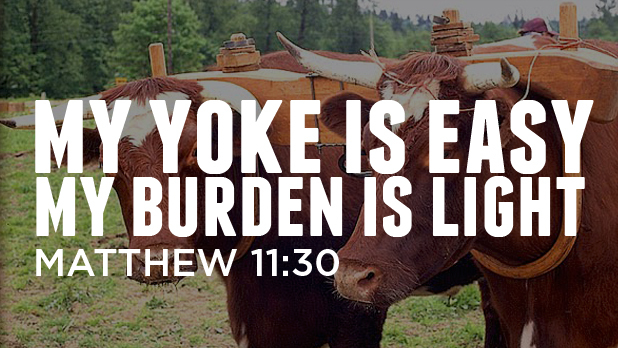 yoke is easy, and my burden is light! We all know someone who’s in a difficult situation (maybe it’s one of us) . . . like the man who accepted Christ in prison, but has been given a life sentence ; The woman who has faithfully taken care of her severely challenged son for fifty years ; or, the young woman who suddenly lost her sight in an accident and now lives in darkness! We often think, I’m glad that isn’t me! But, perhaps these friends have found the secret to a freedom that eludes us most of the time. God has taught them how to live with hardship by receiving grace after grace from Him! They live as the one described in Psalm 84:5-7 (AMP): Blessed is the man whose strength is in You (God), in whose heart are the highways to Zion. Passing through the Valley of Weeping, they make it a place of springs . . . blessings. They go from strength to strength! In Matthew 11:29-30, Jesus said, Take My yoke upon you and learn from me, for I am gentle and humble, and you will find rest for your souls. 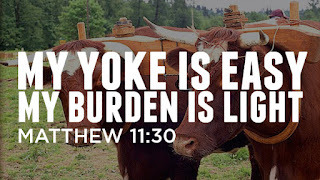 For My yoke is easy and My burden is light! We don’t wear a wooden yoke like the one animals wear. The yoke for believers is a place of rest - relationship - and belonging! Father – thank you for the power of the yoke! Come and slip it on me! There is no struggle. It fits me perfectly. It is Your yoke of freedom!